Thanks for a cozy stay, warm and friendly staff. Baie, baie dankie vir 'n pragtige plek en ongelooflike gasvryheid dit het ons groot lekkerte nog lekkerder gemaak! Altyd so lekker om hier te bly & te eet! Baie dankie vir julle gasvryheid! 4 ster wat 'n 5 ster moet wees. is beter as die beste restaurant in Pretoria. Bederf so reg uit Emsie Schoeman se boeke. thank you for making our stay with you so enjoyable. We are all in agreement that Opikopi is like a home away from home. We were comfortable and it was a great place to come back to after a long hard day on the greens. Everyone made us feel very welcome, from you as the owners, to the staff, and even those gorgeous beagles. Should we need to stay in Pretoria again, you can be sure that Opikopi will be our first choice. 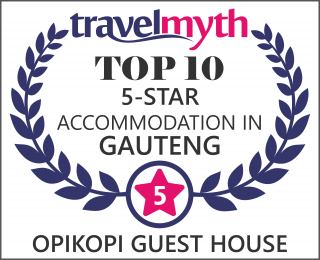 We make use of Opikopi Guest House for our International guests visiting South Africa. We have used them since 2008 to present date without any problems or complaints! Our guests have busy schedules which can change at a moment's notice. We and our guests cannot compliment Opikopi enough for their excellent, personalised service and flexibility. Their food is also of quality restaurant food. Nothing is ever a problem for them and their prices are very reasonable for the quality service they deliver to their clients. Their rooms are also beautiful!!! When you book your guests into Opikopi you can sit back and relax and know that they will be taken care of!